An African proverb rightly says that the cane with which we use in beating the child is waiting for the next child. I saw it coming that our MBBS graduate will succumb to the cheap publicity of going on strike, so as to buy the sympathy of Nigerians, just the way the other medical workers got all Nigerians supporting their strike. I saw it coming that they will turn to the cane (Journalism) to publicize their fight against the Federal Government. I could not help but laugh at a MD consultant who told his colleagues that the battle for their continuous supremacy in the health sector which has now be removed, via the media will be won back through the media; hence they are ready to channel all the resources to use the media. Don't worry, dear friends; many of my colleagues are waiting to lodge your money in their bank accounts, just to write to smile with your money to the bank, while they know the truth that your battle for supremacy has already been fought and lost. At the end of the day; the Nigeria people will be the judge, after all our reports in the media. Facts are sacred, opinions are freely given but when opinions are mixed with facts, they are supreme. Finally, you acknowledge that the media is greater than the medical practice. Truly the pen saves more lives than the stethoscope and takes more life than the surgical knife or drugs can ever dream of. While we do not determine the conditions for associations going on strike; we owe it to the public to present to them if such strike is just and fair. We place their demands on Justita's scale, that ever truthful Roman goddess of Justice. This write-up is for the market woman and the lay man on the street, who may be wondering why another set of doctors are on strike when they just finished experiencing one, hence it will be written in a very simple way. When other medical workers embarked on their industrial action, they instructed only Federal teaching hospitals and medical centres to shut down their services, an action which by all human standards was fair and just. We need not imagine the calamity that would have happened had the State and local government hospitals embarked on such 'crucification' of Nigerians. When the media for the first time in history reported daily the pains and agony of Nigerians while the strike lasted, the Federal Government finally called them to a round table, where their fair demand were met. Is it a way of getting back at the FG for finally putting the MBBS personnel's' where they belonged that the ARD has embarked on strike? The bitter truth behind this strike has not been placed on the table; what they truly want is still been hidden but we will know. What are these demands and the hidden agenda behind it? First of all, I refused to be among the few sets of Nigerians who can be brainwashed that the failure of IPPIS to correct the abnormality in the system is enough reasons to go on strike. Come off it guys; there are over 20 ministries in the country experiencing the same IPPIS problem and they have not staged a show down with the government. The fact that they have not complained does not mean that they are not hurt by it. We live in a country where every method newly introduced is always problematic and this IPPIS is one of such. Various interactions with medical workers reveals that they are even under-paid than the MBBS graduates, using this IPPIS method, but they have not cried blood. The Federal Government has not said it will not be rectified; so why the rush to embark on this industrial action? The government may not be sincere when it comes to implementing agreement, but let Nigerians know the truth that the IPPIS issue is mainly the fault of the private company which it was given to handle and not the fault of the Federal Government. For once, let's stop giving a dog a bad name to hang it. No government forced a child to read a course of his choice; and if this be the case, the nation should not be made to pay the bills of any MBBS graduate who wants to go into residency. For crying out loud, many Nigerians who are in the know that the government budget money for residency training of MBBS graduates has kicked against it, and still kick against it. Whoever feels he wants to further his knowledge by going into specialization should bear the cost alone without having to bother the government about it. To go the extra mile of giving asking the government to produce a blueprint for residency training with 'immediate effect' is madness of the highest order. Do they forget that the money to be used for such personal trainings do not belong to the government but Nigerians? What manner of self inflicted ego that has been battered will make a beneficiary order her benefactor to take money from a general purse to fund what benefits them? Let no one give us the crap that it is for the benefit of the patients; we all have services we render to clients and if all graduates of the various courses begin to demand for training in their various field of endeavor, where do we turn to in getting the finances to foot the bills? Nurses in the USA do residency, but not so in Nigeria, yet they have never complained, despite the fact that they have specialization in their own professions. What did we hear them say about overseas attachment and other elements? I see the Federal Government biting more than it can chew as other professions will soon besiege the National Assembly to demand for such overseas attachment and other elements (Whatever that means). It is a public knowledge that the health sector are among the highest earners in Nigeria; though they are quick to say that they are not well paid like their counterparts abroad, as if Engineers and Teachers are not underpaid in Nigeria? If they wish they to travel out overseas for training, let them save part of their salary to do so, except the state or hospital is sponsoring such trainings. Enough of this undue advantage over other government workers, unless the government is tired of funding the health sector; then it should wash her hands off and let's watch them go on strike in the private sector. The victimization of ARD members in FMC Owerri by her Mrs. Angela is not a federal government issue. Let it be stated the form of victimization that she is alleged to be meting out to ARD members, when one of the MBBS graduate who spoke to me barely two weeks ago praised her to the high heavens. The issue of Ebonyi State University Teaching Hospital not implementing the CONMESS is a state issue and not a Federal Government matter. If the ARD feels aggrieved about it; they should embark on industrial action in the state, just as their counterpart in LUTH did two weeks ago (though no one felt their absence), and not making it a national issue. We may have axe to grind with the Jonathan administration, but we owe it as a duty to be impartial in our reports, columns and write-up. For real, this is just not right! The Federal Government must as a matter of urgency begin to hands off residency training to a select group of practitioners, when every profession has her peculiarity that needs special training and re-training. As the Government accepts the Presidential Committee's recommendation that COREN should no longer receive budgetary allocation from 2015 Fiscal Year Surveyors Registration Council (SRC) and Budgetary Allocation to SRC stopped with effect from 2015 Fiscal Year; let budgetary allocation for residency training be stopped from 2015, unless they are ready to start funding the residency of other medical workers as well as training funds for other professions with media practitioners in government agencies benefitting. Information reaching us already says that the striking workers are driving away patients from the ward. While we refuse to believe it yet until personally confirmed, Nigerians should know that when other medical workers went on strike, their consultants and management staff did not; as it's is against labour rule for them to do so. ARD has no right to ask patients to leave the ward or any part of the hospital, when the nurses are there to treat and take care of them, and the consultants are always available to attend to them. Enough of drafting house officers and NYSC members into their strike. House officers and youth corp members are not legalized to go on industrial actions, and we saw this played out during the last medical and health workers strike; this should not be different. I truly do not know what they want in their agitations; if they are not asking for salary increase, they are demanding for training as if other professions do not want to be trained by the federal government or they are asking that pharmacy, radiography and medical lab should be out sources. This is where they get it wrong always. Outsource what? I know how much I pay outside the federal government hospitals when I carry out a test, and yet someone who feels threatened by another profession wants med lab to be privatized. There is absolutely no sense in such a call. To think of asking patients to go outside the hospitals to buy medication when they come for treatment is an act of malicious wickedness. We patronize government pharmacies because they are cheap and we are sure that we are buying the correct drugs that are not expired, and yet an association president comes out to say that it should be outsourced. A visit to a laboratory to do some scan cost me huge sums of money, scans that would have been half the amount, where it at a government hospital and someone wants me to keep paying such huge amount of money in a private lab. The NMA National President, Dr Enabulele Osahon who is making such statement is a man i respect, a friend i hold dear, someone whom i respect his opinions and wish that most of these MBBS persons can be like. Talking to him and listening to him gives you assurance that there is hope for Nigeria; yet he is human and fallible. Such statement from him betrays his human nature and our friendship does not stop me from pointing out when and where he has erred; such as this. If the government buys into such Golgotha idea, it could as well outsource surgery department, since such can be done by private hands, then let's see how many doctors will be employed to work in the hospital. The demand for surgeon general has no base on which it stands in Nigeria. Such applies only in the USA, and I will urge the proponents of such call to study the history of how that office came about in USA, before drumming for such outdated position in Nigeria. We reject it! Enough of these unnecessary strikes by MBBS graduate! Nigerian workers who went to school to study courses of their choice are not fools that an infinitesimal profession should begin to dictate every now and then their terms of service. Every Nigerian worker who went to the Ivory towers deserves training and re-training as well as good remuneration and the fact that they have not had a show down with the government should not be seen as weakness or their being comfortable with their job or working environment. The lawyers, teachers, engineers, surveyors, media practitioners (who have sacrificed more for Nigeria, except for our security agencies), accountants, uniformed men, administration workers etc are all entitled to all that the medical and health workers constantly agitate for. The fact that they chose a different field of endeavors and not health profession is not to say they could not have chosen otherwise, but to fulfill their calling on earth. This game of threat by medical workers especially MBBS graduates, is taking a dangerous bend and the earlier it is nipped in the bud, the better for the health system. No one is forced to work in the government hospital and if such a practitioner is tired; they could as well look for jobs in the private sector or go out of the country to work. The issue of constantly mentioning 'brain drain' is a ploy to make them look relevant, as every profession have their own brain drain. If any of the medical profession should be complaining of brain drain; it should be the DPT who are less than 1100 currently practicing in the country, yet we have cases such as cerebral palsy, erbs palsy and lots of others that are managed are treated solely by them, not the MD, who are all over the country looking for jobs, with thousands of them scattered all over Nigerian universities waiting to graduate and join the labor market. The earlier we tell ourselves this bitter truth; the best for all of us as a people and a nation. If this is not done, I foresee the era during the 70s, when we had 'super' permanent secretary during the Gowon administration; one of the reasons for the coup plotted against him by Murtala, cropping up in this country. There are no 'super' career, worker or profession; SIMPLE! Of a truth, this strike has the voice of Jacob but the hand of Esau; only time will tell. 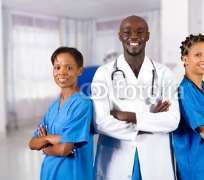 For MBBS graduate such as Chukwudumebi Onyiuke, who are of the opinion that I should tell my wife or fiancée who is a nurse to go and read any course that will make her be called a doctor, and David Obinna who writes that 'Fejiro Oliver, I dare you to talk to any of the Medical Doctor, Doctor of Physiotherapists and Doctors of Dentistry and see if any of them will agree to marry you. These three sets of doctors that you loathe are well ahead of you and you can only talk to them from a distance', I wish you a happy stay at home for we are glad to miss you.